​HOME VISIT AUDIOLOGY SERVICES: TRENDING NOW! Discounts on two new hearing aids with iPhone connectivity! Monday, March 25 - Hearing Wellness Talk: Sound Check – Celebrating Life Through Better Hearing. 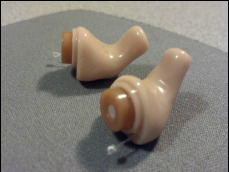 SPECIALTY CUSTOMIZED EAR PLUGS -- Call now for an appointment! GREAT FOR OUTDOOR CONCERTS, MOWING THE LAWN, ALL THOSE PROJECTS THAT YOU USE YOUR POWER TOOLS FOR! Audiological evaluation and treatment provided by a Doctor of Audiology in the comfort of your own home, office or other convenient location. Assessment of your real life hearing needs. Care at a convenient time. You will not feel rushed. Providing quality audiological services in your home or other quiet convenient location.